OUI defense attorney James P. Geraghty is a highly specialized Boston area lawyer dedicated to defending clients specifically dealing with OUI, DUI and Drunk Driving related criminal charges in Massachusetts courts. He is a member of the National College for DUI Defense, National Association of Criminal Defense Lawyers and Massachusetts Bar Association. Attorney Geraghty has authored several well known books for law schools (and other attorneys) on complex drunk driving defense strategies and was recently a featured instructor/speaker at the National College of DUI Defense's learning seminar for Massachusetts Attorneys at Harvard University in Cambridge, MA. The practice is highly specialized, focusing solely on Massachusetts OUI charges and drunk driving defense, serving Boston, South Shore, North Shore, Metro West, Cape Cod, Barnstable, Worcester, Brockton, Suffolk, Middlesex, Essex, Plymouth and other Massachusetts counties. Here at our Masschusetts DUI law firm, attorney Geraghty and his expectional staff aggressively fight for the rights of our clients. He previously worked as a top prosecutor in the Massachusetts District Attorney's office and has many years of extensive experience successfully handling complex OUI cases. 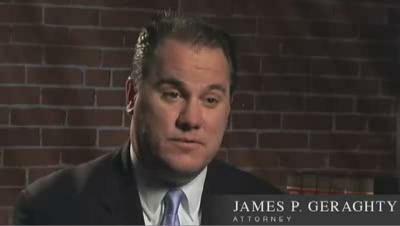 Attorney Geraghty and his OUI defense team employ DUI experts who have remarkable "state of the art" knowledge in the areas of field sobriety testing, breath testing equipment, blood testing, video defense and overall proceedures used by local police, Boston police and Massachusetts state troopers during DUI stops and road blocks. The firm also has extensive experience handling OUI Marijuana charges, OUI Prescription Medication Charges, OUI Boating, jetski and other recreational vehicle operating under the influence criminal charges. James Geraghty is also a seasoned trial lawyer who regularly takes OUI cases to trial and wins in courtrooms throughout Massachusetts. We're here to help our clients 24/7! Call Attorney Geraghty now for a FREE DUI case evaluation at (617) 571-5487. A higher level of dedication to our clients is extremely important to us. This is what sets our OUI law practice apart. We feel that excellent communication is vital to successfully serving each of our clients. Attorney Geraghty takes great care to keep every client informed on the progress of their case. All clients recieve Jim Geraghty's personal cell phone number and direct email address. The Law Offices of OUI defense attorney James P. Geraghty provides 24 hour emergency assistance as well as reasonable fees with payment plans available. We are proud of the fact that many of our OUI cases come to us through referrals from other respected law firms and clients that have experienced our effective advocacy and passion for protecting the legal rights of each of our clients. At the law office of James P. Geraghty, we have a strict definition of winning. To us, winning your OUI defense case means getting a not-guilty verdict or having your case dismissed — that is the best result for you. Yes, other outcomes may be seen as positive. In Massachusetts, an OUI or DUI defense case can end in something called a "continuance without a finding". It may also end with a plea bargain that minimizes the negative consequences. When other lawyers plea your case out we go to trial and WIN! Other lawyers may refer to achieving these outcomes as winning, even though neither of them will leave you completely in the clear. We don't consider that winning. At our law firm, we go for the true win and we give you our best efforts to do so. Attorney Geraghty handles every case personally. When going to court, he will be at your side protecting your rights. As a former top Massachusetts criminal prosecutor Attorney Geraghty knows how the police and court prosecutors prepare an OUI case against you. He is (as one former client put it) "at home" in the courtroom. His years of providing effective defense for people accused of OUI, also known in Massachusetts as DUI or DWI, makes a big difference when taking cases to trial. Our team takes great care in building cases that are designed to do nothing less than win. We use the best experts and thoroughly investigate the charges against you. We are ready to take on DUI and all related charges for people in Boston and throughout Massachusetts. Call us at 617.571.5487 or send us an e-mail to schedule a meeting with a Boston DUI defense attorney with more than a decade of exceptional results.